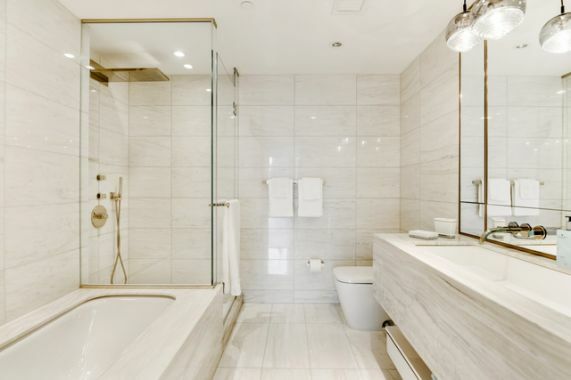 Stunning 1,432 square foot, 2-bedroom, 2-bathroom residence, tastefully furnished with all the amenities of modern luxury  the perfect retreat in the heart of Midtown Manhattan. This mint condominium home offers luxurious design and finishes throughout, including rift-sawn 5-inch white oak plank flooring. From the entry foyer, which includes a spacious double-door coat closet, a gallery leads into the corner Great Room where floor to ceiling windows showcase exceptional south- and east-facing views of the city. For seamless living and entertaining, the living area melds with the open chef's kitchen, which features Italian walnut and custom white back-painted glass cabinetry, Calacatta Vision polished marble countertops, Watermark fixtures, and premier appliances by Miele. The Great Room is also fully outfitted with a state-of-the-art Bang & Olufsen BeoLab Sound System, a 40 Bang & Olufson BeoVision 10 Television, and high-end furnishings from Roche Bobois and more. The luxurious Master Suite is filled with light from a wall of south-facing floor to ceiling windows, and has ample space for any wardrobe with multiple deep closets. The en suite master bath, accessed through custom Rimadesio white glass pocket doors, has radiant-heated Siberian White marble flooring, a custom vanity topped with Siberian Mink stone, imported Italian Fantini fittings and fixtures, a soaking tub, and separate walk-in shower. The second bedroom is generously proportioned, with south-facing exposures and beautiful natural light. A second full bathroom and in-unit Miele washer and dryer complete this well-appointed home. 135 West 52nd Street offers residents a host of amenities, including a 12,000 SqFt Private Residents Club, 75-Foot Indoor Swimming Pool, State-of-the-Art Fitness Center, Luxurious Spa, Childrens Playroom, Golf Simulator, and 24-hour Doorman and Concierge Services. Offered fully furnished for 4-12 months. Showings by appointment only  currently occupied, available for a May 15 or June 1 move-in.